Having consumed three steamed potatoes for breakfast and a sizeable chunk of salmon with a side of rice for lunch, I wasn’t particularly fond of eating anything heavy for dinner today. 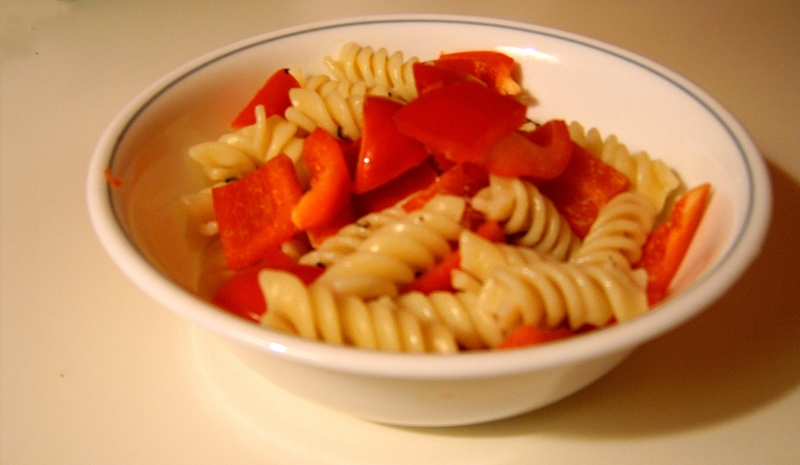 So, instead of eating what my mom was cooking up (pasta, mixed with sauteed bok choy and chicken strips), I decided to make my own dinner: A refreshing pasta salad, with cold milk and raw red bell peppers. Yum. Cook your pasta. Dried pasta doubles in size when cooked, so if you want two cups of cooked pasta, dump one cup dried pasta into your boiling water. Boil for 7-10 minutes, depending on how chewy you want your pasta. I don’t add salt to my boiling water, because I don’t like salty foods. Drain your pasta. Run it quickly under cold water and drain again. You don’t want your pasta heating up your milk or bell peppers. Mix in the chopped bell peppers. Add as much or little milk and pepper as you want. At this point, feel free to put any condiment in you want. I like using Diana Sauce, a thick, sweet, full-bodied BBQ sauce. I used the Gourmet Maple flavour. And you’re done! :D That was fast, wasn’t it? A perfect meal for someone on the go, for a hot summer night, or perhaps someone who has had too many heavy meals already in the day.